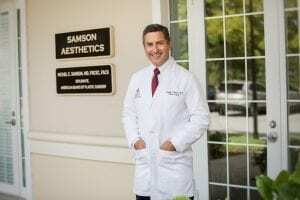 Dr Samson and his team strive to maintain a comfortable, caring and safe experience for all of our patients. Our office is conveniently located at the Surgery Center of Volusia, in Port Orange, greater Daytona Beach, Florida. The Surgery Center a fully AAAHC Accredited, new and modern facility featuring three operating rooms and Board Certified Anesthesiology. We look forward to welcoming you into our practice.